Regal purple guilloche enamel with a finely engraved pattern of jagged nested circles surrounded by white enamel borders and yellow gold edges. Luminous pearls rest in the centers in yellow gold settings. Beautifully crafted by Carrington & Company in 14kt gold, circa 1925. The backs of the cufflinks are as well crafted as the fronts yellow gold polished to a mirror-like finish. Sturdy cross bars and strong brackets with beveled ends to ease the passage of the cufflinks through a button hole secure these cufflinks on the cuff. The meticulous care with which these cufflinks were crafted and the design of the linkage indicates that these cufflinks were created by Carrington & Company. Carrington was a maker of fine cufflinks and other gentleman's accessories during the first half of the 20th century. The firm's cufflinks and dress sets were retailed by Tiffany & Co. and other carriage trade jewelers of the day. Measurements: These 14kt gold and enamel cufflinks are 9/16" in diameter and weigh a total of 9.6 grams. Reference: The enameling technique employed to create these beautiful cufflinks is known as "guilloche enameling". 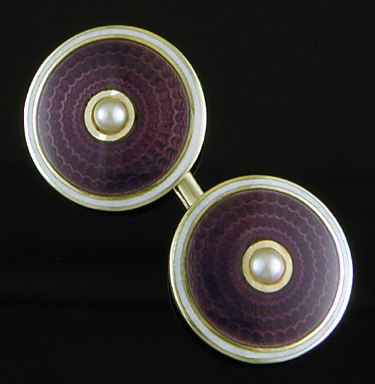 To learn more about this exacting and difficult technique please visit Art of the Enameler - Guilloche Cufflinks".